I’ve mentioned before that I personally don’t consume grain products everyday (see sweet breakfast omelette – what to eat when you don’t eat toast), which is mostly due to the fact that most stores don’t carry products I deem worthy of consuming. For instance if you look at the label of most commercial ‘sourdough’ breads, you may notice that there are around 30+ ingredients (most of these ingredients are not real food and are from refined products; sourdough should just contain a few ingredients (yeast, water, flour and salt, usually)). These commercial grain products I usually find disapointing so I don’t buy them (they also aren’t that nutritious as well!). Apart from slow-cooked oats, I like to have bread and other grain products as more of a treat, rather than an everyday staple (most are refined anyway). But if you make them yourself they can be so more nutritious & really delicious! 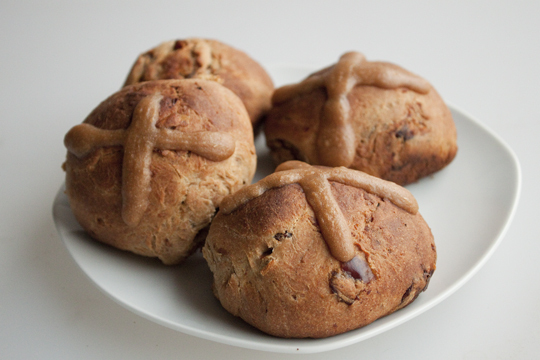 As a treat, I made a batch of delicious Hot Cross Buns (HCBs) for Good Friday. 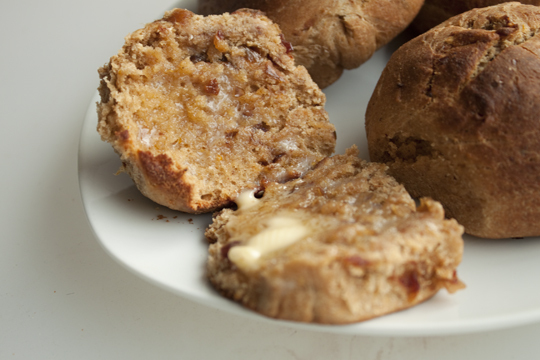 These HCBs were made using wholemeal spelt flour (rather than wheat), buttermilk for extra flavour and to help them rise and I added dates instead of sultanas or currants! So if you would like a healthier while still delicious version of HCBs I hope you give these a go :). Allergen info/recipe info: This recipe does contain gluten (so this recipe is not suitable for those who have issues with gluten/celiacs), dairy and eggs. It is lacto-ovo vegetarian-friendly. 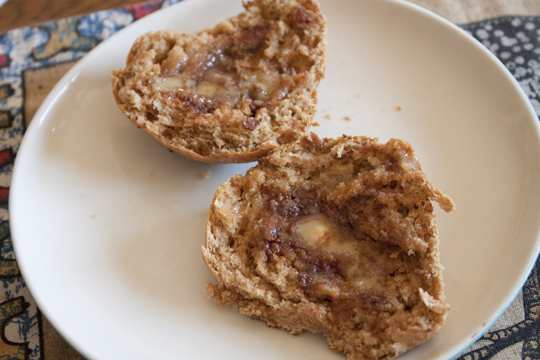 This recipe is a little bit denser than regular HCBs due to the wholemeal spelt flour. Bloom the yeast: Heat the buttermilk in a saucepan on low heat till just warm. Turn off the heat and pour the warm buttermilk in a jug. Mix in the honey and sprinkle the yeast on the top of the buttermilk. Leave to bloom (it gets bubbly & the yeast gets activated) for around 10 minutes. Sift dry ingredients: In a large bowl sift the spelt flour, coconut sugar and mixed spice. Stir in the fennel seeds, orange zest and chopped dates. Mix wet ingredients: Beat the egg into the buttermilk and add the vanilla extract & melted and cooled butter. Pour the buttermilk-egg mixture into the flour. Mix, Knead & Rise: Using clean hands (or a butter knife) begin to mix the mixture together. Knead it for a few minutes (I just kneaded it in the bowl) or until it becomes elastic (you may knead to add a bit of extra flour to the bowl or board if the dough is too sticky). Leave the kneaded ball of dough in the bowl and cover it with a tea towel. Leave this in a sunny warm position in your kitchen for around 2 hours (or overnight) or until it doubles in size. Divide: When it has doubled in size, divide the ball of dough into six equal portions. Knead each individual portion once again until elastic. Rise again & Preheat Oven: Place these pieces into your chosen greased baking tray (I used one around cm wide and cm high). Place each piece about 1-2cm apart. Place this tray covered with the tea towel again and leave to rise for another hour. In the last 10 minutes of rising preheat your oven to 160 degrees C.
Score & Bake: Now get the tray with the dough balls in it and using a knife cut two lines across the top of each one to form a cross. Bake the HCBs in the oven for 15-25 minutes at 160 degrees C (fan-forced) or until they are light brown and cooked through. To test if they are cooked you can poke a skewer in one of them and if they are sticky then it isn’t quite ready yet. Make cross mixture (optional): (in some of the HCBs I didn’t add the paste cross- see the 2nd picture) Make mixture for the ‘crosses’ by mixing together ~ 2 Tbsp. spelt flour, 1 tsp. coconut sugar and enough water to form a thick paste. In the last 6 or so minutes left of cooking the HCBs pipe the cross mixture into the scored crosses and spoon/brush a little bit of milk over the HCBs. Bake until they are cooked through. Serve when hot with a bit of butter. For the first rise I left it to rise & ferment overnight (rather than the 2 hours below) at step 4. I’ve made a varation on the above recipe my adding 1/4 C. of G & B organic milk chocolate (chopped into small pieces) to step 5 (I worked the chocolate chips into each of the 6 pieces of dough). Whether or not you celebrate Easter/Passover I hope you enjoy the long weekend! Holy hot cross buns! 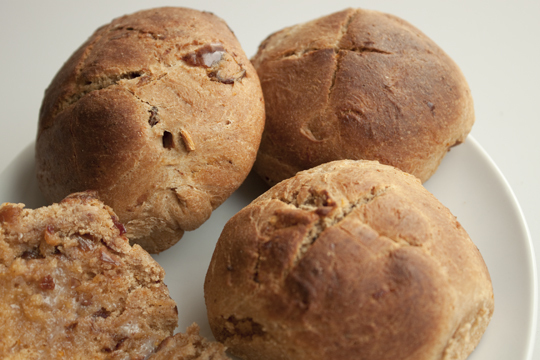 Hmmm… I did notice that The Lifestyle Bakery is doing sprouted hot cross buns… but maybe I should challenge myself to make my own, a la Health Food Lover! Oh please do :)! I think I’m going to make another batch tomorrow of the same but with chocolate chips added for a bit of an indulgence!